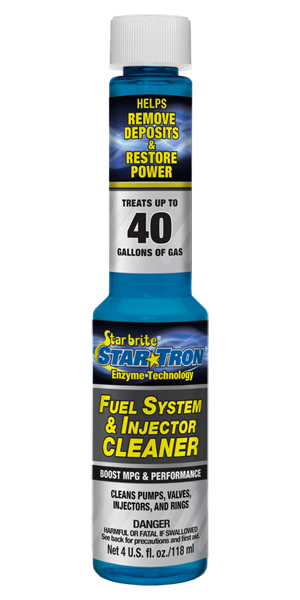 Star Tron® Fuel System & Injector Cleaner is engineered to quickly remove even the toughest performance-robbing deposits from carburetors, fuel injectors pumps, valves or rings that can form on even the newest technology engines. Formulated with a proprietary blend of enzymes and high-performance cleaning agents, it restores power and performance quickly and cost-efficiently. Use 1 fl. oz. of Fuel System & Injector Cleaner for every 10 gallons of fuel being treated. Recommended treatment rate is every 4 to 5 tanks or as often as needed. Using original Star Tron Enzyme Fuel Treatment at every fuel fill is also recommended to keep engines operating at peak performance levels.